K-Tuned Downpipe - Dezod Motorsports Inc - Home of the automotive performance enthusiast since 2002. The 9th Gen Honda Civic SI seems to be following right along in the footsteps of the 8th Gen design. Both cars are pretty similar in style on the outside, but under the hood, the 2012 and up chassis now comes with a bigger K24Z engine and a brand new cylinder head design. Looking a bit more closely at the exhaust side, you’ll notice that the exhaust ports all merge together into a single outlet flange that is cast directly into the head itself. Bolted up to this flange you’ll find the stock catalytic converter positioned right before the exhaust piping. It is pretty much common knowledge that stock catalytic converters can be very restrictive and when they are deleted or replaced with high flow units, the result is noticeable increases in performance. The K-Tuned 9th Gen Downpipe completely replaces the factory cat section with a free flowing 3” downpipe. We started things off with a cast stainless steel housing, designed to offer a smooth transition from the head flange to the exiting 2-bolt exhaust flange. The T304 stainless 3” diameter pipe section is beautifully tig welded and bolts up to the housing, before heading downward perfectly past the factory subframe and swaybar. 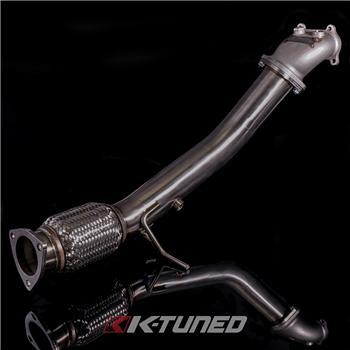 Welded into the lower part of the downpipe is a high quality Vibrant Turbo Flex section with interlocking inner liner to absorb the normal engine movement. On the cast housing, we positioned 2 x O2 sensor bungs, one for the primary O2 and a second for an accessory O2 sensor, which we also include a plug for in case it is unused. The downpipe is available with or without a high flow cat and both setups greatly reduce overall exhaust system restriction. Note that our cat option keeps the cat positioned properly, as close to the head as possible to keep it hot and functioning efficiently. Cats that are positioned too far away from the head do not heat up enough to work effectively. We include all the hardware needed for installation, including: 1 x O2 plug, 2 x serrated M8 nuts, 1 x M8 bolt and 1 x M8 washer for the housing to head connection. Note that some of the original hardware will still be used to hold the housing in place. Be sure to check out our K-Tuned 9th Gen 3” Exhaust System, it will mate up perfectly to our downpipe and gains will increase even more with our complete system.